I recently became involved in a very cool project going on right here in Portland, Oregon. The local food chain Burgerville is opening a new restaurant at the Portland Airport, but they’re doing something a bit different – they are involving the community in the design and development of the restaurant. 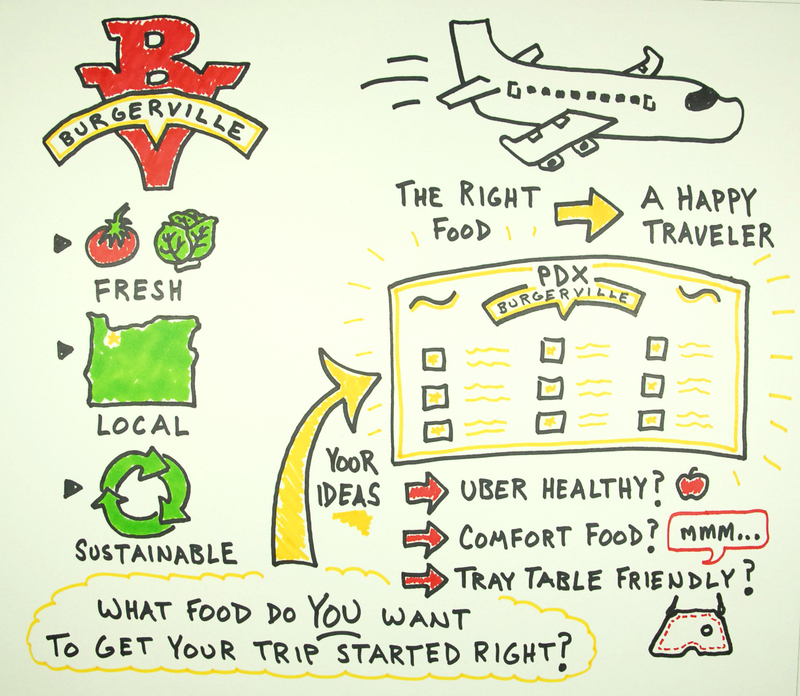 They already have a few ideas for how to make the PDX airport Burgerville unique and well-suited to those who frequent the airport, but they are still looking for input from community members. To help convey the ideas that are already out there and to open the door for new ones, I was asked to illustrate a few of the ideas in a time-lapse format. The videos that resulted can now be found on their website dedicated to the development of the new location. This is a cool project on many levels. For starters, I think it’s awesome that the folks at Burgerville are including community members in the design of their restaurant. They genuinely want to hear what community members want and need, and they are willing to listen to any idea, no matter how crazy it might seem on the surface. They’ve already got a good track record in the realm of local and sustainable food, as well as top-of-the-line treatment of employees. Now they are reaching out to the local community from the very start of the development of a new location. Not bad. I also enjoyed this project because it gave me the opportunity to pull together a number of skills to produce the time-lapse illustration videos that highlighted those initial ideas for the new restaurant. I have done time-lapse illustrations in the past, but I’ve never been in control of each step of the process. For these Burgerville videos I handled everything, from the camera setup to the drawing to the post-editing and video compilation. I even got to do the narration! What that means is that I now have my own time-lapse illustration studio, which I am extremely excited about. Though I have lots of room to grow in this particular form of presenting ideas, I feel pretty lucky to be in a position to produce this style of video all on my own. I’m looking forward to experimenting more with this new art form. If you have a project that might benefit from presenting ideas in the form of a time-lapse illustration, be sure to get in touch!